Here at Flowmech, we supply a wide range of expansion vessels. 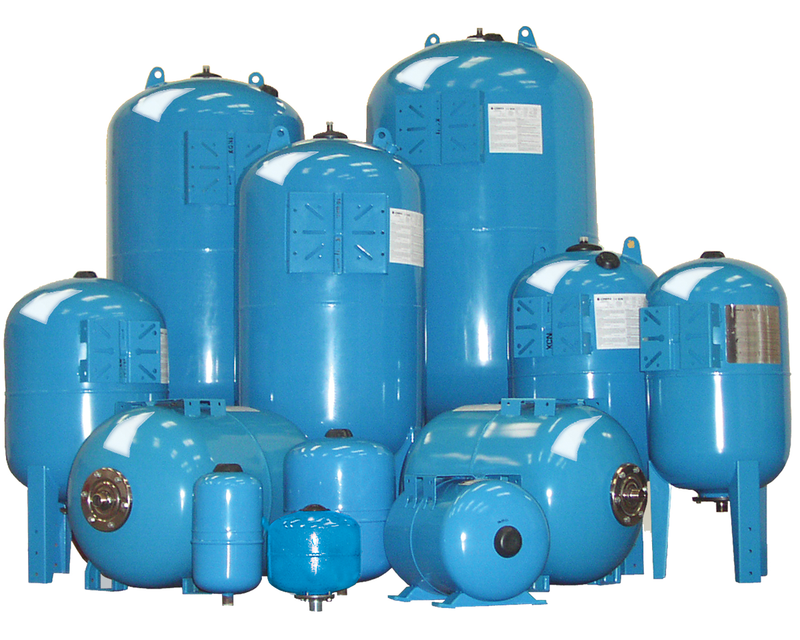 Our diaphragm expansion vessels are available in different pressure ranges and nominal volumes- either flat or cylindrical (depending on the application) and with a fixed diaphragm or replaceable bladder. What is a boiler expansion vessel? The boiler expansion vessel is a small tank that’s used to protect closed water heating systems. It’s specifically designed to make it easier to maintain optimal pressure within a system. Any expansion vessel is divided into two with a rubber diaphragm. One side of the vessel is connected to the pipework of the heating system and therefore contains water, whilst the other side contains air under pressure. What is the boiler expansion vessel used for? A boiler expansion vessel is used domestically for many applications, including hot water systems. The expansion vessel is a critical component for plumbing and heating systems and can prevent pipes and system equipment from bursting. When used in hot water systems, the expansion vessels are designed to conform to potable water regulations. The main purpose of the boiler expansion vessel is to store water efficiently as it expands, once it is heated. We supply them for domestic applications to ensure that thermal expansion is dealt with appropriately and to prevent water pressure from getting too high. How does the expansion vessel pump booster work? The expansion vessel pump booster provides a cushion against shocks that are often the result of small influxes this prevents unnecessary pump starts. We can supply a range of manufacturer’s vessels including Zilmet, Reflex, Varem and Cimm, so you needn’t worry about finding what you’re looking for! Zilmet is Europe’s largest manufacturer of expansion vessels. They are committed to research and development and are constantly investing in their products to ensure that they accommodate for the needs and wants of everyone. The Zilmet expansion vessel is renowned for high-quality and performance, and here at Flowmech, we supply the Zilmet expansion vessel which is part of an advanced range. The Zilmet expansion vessel acts as a surge tank, controlling the pressure rate and reducing the risk of pipes bursting. In the home, the Zilmet expansion vessel is used to supply drinking water and can also be used in boilers to help maintain water pressure- ensuring that appliances reach full power. For more information about the expansion pump, call us today on 0116 242 5425 and we can provide you with any advice or support that you need.